To understand Cubism it helps to go back to Cézanne’s still life paintings or even further, to the Renaissance. Let me use an example that worked nicely in the classroom. I was lecturing, trying to untangle Cubism while drinking increasingly cold coffee from a paper cup. I set the cup on the desk in the front of the room and said, “If I were a Renaissance artist in mid-15th century Italy painting that cup on that table, I would position myself at particular point in space and construct the surrounding objects and space frozen in that spot and from that single perspective. On the other hand, if this was the late 19th century and I was Cézanne, I might allow myself to open this view up quite a bit. Perhaps I would focus on, and record, the perceptual changes of shape and line that result when I shift my weight from one leg to the other or when I lean in toward the cup to get a closer look. I might even allow myself to render slightly around the far side of the paper cup since, as Cézanne, I am interested in vision and memory working together. Finally, if I were Braque or Picasso in the early 20th century, I would want to express even more on the canvas. I would not be satisfied with the limiting conventions of Renaissance perspective nor even with the initial explorations of the master Cézanne. As a Cubist, I want to express my total visual understanding of the paper coffee cup. I want more than the Renaissance painter or even Cézanne, I want to express the entire cup simultaneously on the static surface of the canvas since I can hold all that visual information in my memory. I want to render the cup’s front, its sides, its back, and its inner walls, its bottom from both inside and out, and I want to do this on a flat canvas. How can this be done? The answer is provided by The Portuguese. In this canvas, everything was fractured. The guitar player and the dock was just so many pieces of broken form, almost broken glass. 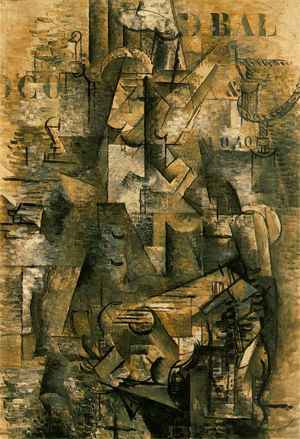 By breaking these objects into smaller elements, Braque and Picasso are able to overcome the unified singularity of an object and instead transform it into an object of vision. At this point the class began to look a little confused, so I turned back to the paper cup and began to tear it into pieces (I had finished the coffee). If I want to be able to show you both the back and front and inside and outside simultaneously, I can fragment the object. Basically, this is the strategy of the Cubists. Cite this page as: Dr. Beth Harris and Dr. Steven Zucker, "A-Level: Georges Braque, The Portuguese," in Smarthistory, July 26, 2017, accessed April 23, 2019, https://smarthistory.org/braque-the-portuguese-2/.